On September 13, LA Opera kicks off an exciting 2014/15 season with La Traviata. Following the success of the mesmerizingly beautiful Thais,Plácido Domingo and soprano Nino Machaidze come together once again in this Giuseppe Verdi classic under the baton of Music Director James Conlon. Maestro Conlon will also conduct our highly anticipatedFigaro Trilogy which follows the development of Figaro, one of opera’s most famous characters, from barber to bridegroom to older-but-still-wily servant in Corigliano’s The Ghosts of Versailles (Feb. 23-Mar. 1, 2015), Rossini’s The Barber of Seville (Feb. 28-Mar. 22, 2015) and Mozart’s The Marriage of Figaro (Mar. 21-Apr. 12, 2015). With Ghosts of Versailles, we’re thrilled to welcome Tony Award-winning director Darko Tresnjak (A Gentleman’s Guide to Love and Murder) in his return to LA Opera along with Patricia Racette – who’s been called one of the greatest singing actresses of our time – and two-time Tony Award-winning Broadway legend Patti LuPone. 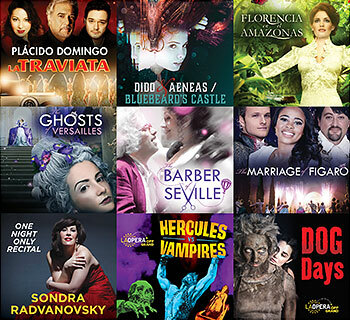 The mainstage season also includes a unique double bill of Purcell’s Dido and Aeneas and Bartók’s Bluebeard’s Castle (Oct. 25-Nov. 15, 2014) starring Liam Bonner (Billy Budd) and directed by Magic Flute director Barrie Kosky, Daniel Catán’s Florencia en el Amazonas conducted by Resident Conductor Grant Gershon (Nov. 22-Dec. 20, 2014) and a recital by soprano Sondra Radvanovsky (Nov. 8, 2014). If you’re looking for something new and different, LA Opera Off Grand brings two strikingly innovative productions to Los Angeles , the film/opera mash-up Hercules vs Vampires (Apr. 23-26, 2015) which pairs a 1961 sword-and-sandals movie by Mario Bava with a new operatic score by L.A.-based composer Patrick Morganelli, performed live by a cast of singers drawn from our Domingo-Colburn-Stein Young Artist Program, accompanied by a 26-piece orchestra. We’re also collaborating with REDCAT and Beth Morrison Projects to present Dog Days (June 11-15, 2015), a powerful contemporary opera by composer David T. Little and librettist Royce Vavrek. Individual tickets for all productions are available now at www.LAOpera.org or via phone at 213.972.8001.